Apologies in advance for the question no doubt I'm overlooking something very easy however I have spent some time and still can't seem to get things working. Basically when I export my plugin as vst. and load it up in Ableton any image appears totally white in Ableton. The images work in Cabbage which is making me wonder what is wrong. I have the image file saved in the same folder as the .csd file. I have tried looking on the forum for a solution and using cabbage 2.0, along with different image types all with no luck. 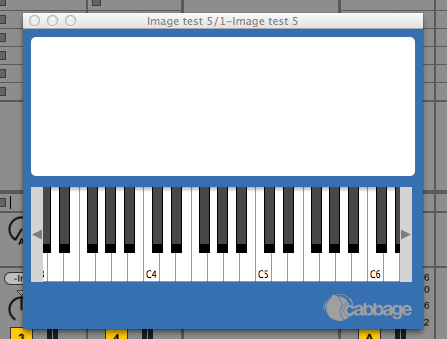 I feel Ableton is not locating the image so tried saving the image into my vst. folder, again with no luck. Below is an image of what appears in Ableton. Any help is extremely appreciated thanks! You don't need to pass an absolute path to the bundle() identifier. Just pass it the same path you would the image() identifier, i.e, bundle("Poster-High-Res-1-.png"). And you can pass as many images as you like in a single bundle() identifier. Btw, import() is not use in this situation. It's intended for a different use altogether. Thanks for getting back, I will have another attempt hopefully with more luck thanks. All you need to do is highlight the code and then press the preformatted text button. No worries. Anyhow, I tried a simple test here myself with the bundle identifier and it all worked fine. I'm sure the issue was with the path.